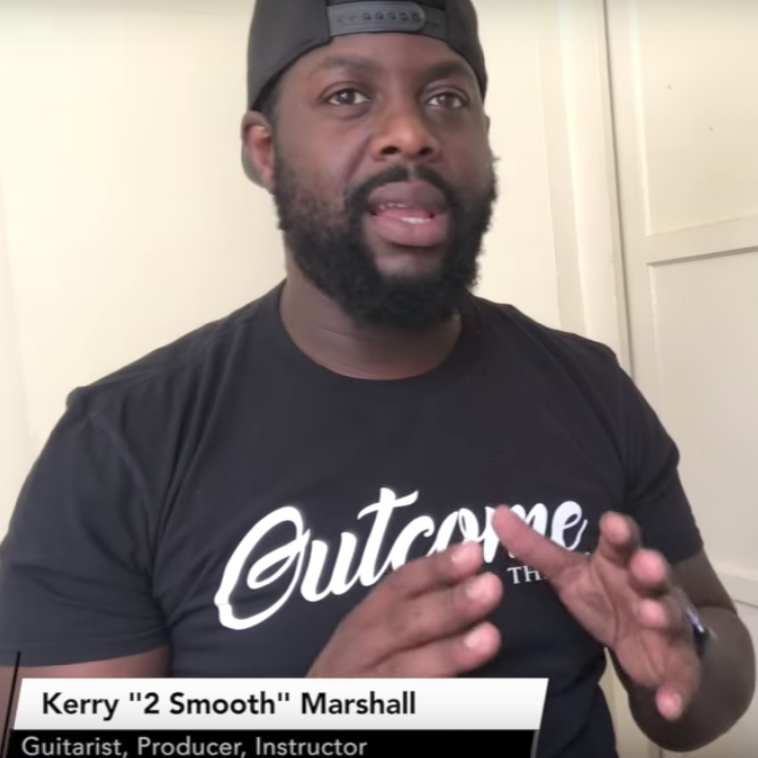 Whether it's through touring and recording with superstar artists, releasing his own original music, or educating a community of dedicated fans through his highly successful RnB guitar course and YouTube channel, Kerry "2 Smooth" Marshall's signature sound continues to draw listeners in. We caught up with the US Army veteran to grab some tips on how to satisfy fans and big name clients alike. What are the necessary skills for RnB guitar gigs? You have to be proficient in knowing how to play chords. You don't have to be so well-versed that you play chords like a keyboard player, but you need to have a good arsenal of chords, because the chords are what help tell the story. Take the time to really understand strum patterns and playing palm muted. It's important to have a good discipline to know how to play with the band, and if you have pedals, to know how to use them to accentuate the song. Take the time to learn how to adjust your equipment and use it properly so that everything you play is tasteful, pleasant to the ears and doesn't overshadow what the artist is doing. What's something a lot of aspiring players overlook when trying to learn RnB? Some people overlook different chord voicings and chord placements. For example, you might learn how to play a minor 11 in the place of a minor 7th. 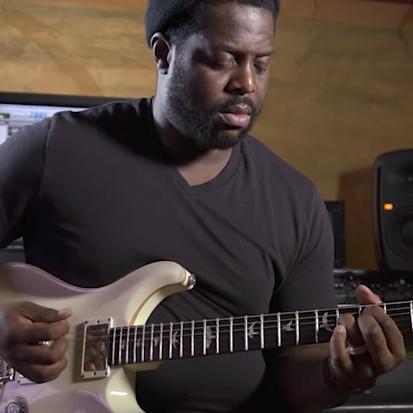 You want tonal qualities that can enhance what you’re playing vs. the next guy. Because we’re all playing minor 7ths - what really makes me stand out from the next guy? And then, understanding how to play with fills. That’s one thing I really grabbed from Eric Walls (Vertex artist and guitarist for Beyonce). If you listen to Walls play by himself, he can really sustain without a drummer, bassist or keyboard player. He makes you feel what’s in the song. Sometimes that can mean rhythmic plucking and picking, or the little kind of trills that you do on the strings. Various nuances like that are what set you apart when it comes to playing RnB, because RnB is about feel, soul, and the emotion that you have when you hear the music. It’s not just about playing the parts. What tips do you have for improving one's rhythmic playing? Listen to a lot of drummers. Listen to how drummers play - sometimes they’re playing with the tom fills, or on the snare, the hi hat - you want to mimic that with your guitar. You don't have to go rhythm for rhythm, but find out how to play the rhythmic ghost note stuff without actually playing notes. Find out how to play palm muted, or different riffs in between so you’re not overdoing the song. Even when I’m rocking on a guitar, I try to think “I gotta make the artist wanna put their foot down." The artist that helped me understand this was Ledisi. She’s really big on rhythms. A lot of times we would do gigs and it would just be me, her and a background singer, so I had to be all three parts. I gotta play guitar, the rhythm part, the percussion, the bass line. So when I’m playing, I don’t just lay on chords. In between, I have some kind of rhythmic muted stuff that I do with the strings so we don’t lose the intensity of the song. How about pedals for a great RnB sound? For base pedals, I would say to get a decent reverb, a good overdrive for whenever you need to do lead lines or solo, a good delay pedal, and a tuner, of course. With those, you can go play for anybody that does RnB at any level. As far as reverb, what you don’t want is something that’s too boomy with so much echo in the room that it sounds like you’re far away. You want something that gives just a little bit of warmth, color and clarity to the sound. For delay, you don’t want anything where there’s trills back to back. I try to get a slow delay - something I can swell into. Because you don’t do it for every song - only for certain spots in the song, kind of like you’re making the guitar cry a bit. What can guitarists learn from soldiers? The military gave me a really good structure and helped my focus and discipline for things like being on time, practicing to make sure I know the music and am squared away for a gig, as well as knowing how to handle myself on the road and working with different personality types. I was a part of the combat MOS - combat arms - where you have to train with your weapon, constantly. You have to know how to clean it up and know how to use it so you’re more proficient when it comes time to actually be called to duty. I apply the same principles with guitar. You gotta understand your guitars, the woods, the pickups. Understand how each pedal works, find the right tones for your overdrive, reverb and delay, and any other kinds of pedals. The more comfortable you get in your own personal time, the more comfortable you’ll be when you’re on stage. You can stay up-to-date with Kerry on Instagram, Facebook and his website!